This past Tuesday, I announced my Microsoft-only experiment. My goal was to only use Microsoft devices for a week -- not easy for a Linux user -- and I have since followed through on that commitment. Armed with only a Surface 2 (Windows RT 8.1), Nokia Lumia 928 and a Windows 8.1 desktop, I managed to make the transition, although it was not all sunshine. More on that later. As someone who writes a lot, a good keyboard is a must. Believe it or not, the Surface's on screen keyboard is simply brilliant. I can type better on it than the iPad or any Android keyboard. It is very responsive and the auto-correct feature works well. I even find the audio feedback to be oddly pleasing. On Android, I turn off the volume, as I find the clicking sound to be annoying, not here; it actually adds to the experience. 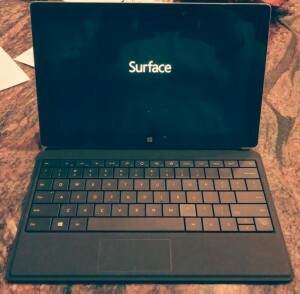 Typing on the Surface Type Cover is a wonderful experience too -- the keys are responsive and give good feedback. However, the touchpad is rather poor, albeit functional. While it works, it is far too small and clicking is not reliable so it is hard to be confident in your actions. Since this is a tablet, consuming media will be a big part of the overall experience. I watched TV shows like Orange is the New Black via Netflix on the Surface 2 and the 1080p screen really shines. Even full-screen YouTube videos look amazing -- this gorgeous screen is a dream. I also did a little bit of gaming with Rayman Jungle Run -- my favorite casual game. The game can be played with the touch screen or a keyboard. Using the new Type Cover, I could use the space bar to make Rayman jump and fly. While the game works great in tablet mode, the keyboard adds to better immersion. Of course, since I am going "all-in" on Microsoft, I want to use its services too. I am a huge user of Google Play Music All Access, which I declared to be an iTunes-killer back in June. For my experiment, I decided to first try Xbox Music. You know what? It's really good. In my testing, the music selection seemed as good as Google's, which was my primary concern. Since it is a native Modern UI app and not a browser-based affair, I was able to have it run in the background. I can skip tracks with the controls on my Bluetooth headphones -- this is not possible with Google's web service. While Xbox Music is a great experience, I wanted to test Google's music service too, to be sure it works. After all, the average Surface 2 user may try to do the same. Sadly, the tablet refused to play audio in both the Modern UI and desktop versions of Internet Explorer 11. To quote Florida from Good Times when James died, "Damn, Damn, Damn!" Surface Team -- Are you getting any sort of error message? Can you play any other online music site? Brian Fagioli -- No error message. Amazon Cloud Player works fine. It only doesn't work on @googleplay music . Surface Team -- Have you tried compatibility view? Press gear icon in upper right, developer tools, browser mode: IE 11 compatibility view. Brian Fagioli -- I did, still no sound. Can you test a Surface 2 (running RT) on your end with @GooglePlay Music All Access and see if it works? Surface Team -- Since this is the only site, please contact Google Play support. Thank you for contacting Google. It seems that we got disconnected, but I am still here to help. I'd like to let you know I'll do everything I can to resolve the issue you're experiencing. I did look into the device and could not find much on the matter, so I am going to provide some troubleshooting steps to see if it resolves your issue. If these steps do not work, please do not hesitate to let me know by replying to this email, and I'll be happy to assist you further. Thank you for contacting Google. I'd like to let you know I'm here to help and I'll do everything I can to resolve the issue you're experiencing. So I did look into it a little more, and it doesn't look like the Surface 2 is a supported device by us. I would try contacting the manufacturer to see if maybe they may have some troubleshooting steps for the device. I was faced with the most dreaded conundrum that a consumer can face -- each company was blaming the other. In other words, I was on my own. I did a factory reset of the device but still, Google Play Music All Access just didn't work. I don't know who to blame, Google or Microsoft. Either way, I will continue to enjoy the awesome Xbox Music. Suffice to say, I am satisfied with the Surface 2 thus far, but there is another device in my experiment -- the Nokia Lumia 928. I have used this device in the past but forgot just how much I love it. Windows Phone 8 is really fun to use -- it is fluid and intuitive. The camera takes amazing pictures and that is very important to me. It's been a few days and I haven't used the Windows desktop yet -- a true testament to the Surface 2. All in all, a good start. I am looking forward to testing the Surface 2 more and will continue to share my experiences as the experiment continues.